Up until now, a veil of mystery surrounded the techniques used to create great abstract paintings. 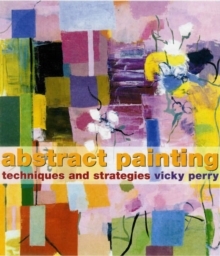 ABSTRACT PAINTING TECHNIQUES AND STRATEGIES lifts that veil to reveal the exact methods behind the masterworks. Now students and professional artists can stop guessing and start building on the techniques of the great abstract artists to create their own innovative new work. Two clear, comprehensible sections let artists focus quickly on their specific areas of interest. The first section, on Traditional Painterly Abstraction (brush and easel painting) looks at pictorial space, brushwork, paint quality, and collage. The second section, on Post-Painterly Modern Abstraction (non-easel painting), considers options ranging from the pour-and-spatter techniques of Jackson Pollock to the staining, scraping, and abrading of modern acrylic artists. Step-by-step recipes for key approaches show every artist how to get the best aesthetic results, freeing them to move forward philosophically.